CheapThrills: Teeny tiny snippet from my Age of Conversation chapter - contributors, send me one from yours! Teeny tiny snippet from my Age of Conversation chapter - contributors, send me one from yours! Update: I've started cataloging all of your excerpts here. Check out what your co-authors are writing! The Age of Conversation 2008 is now on its path to production. Today, 275 bloggers are slated to send their 400-word chapters to Drew McLellan and Gavin Heaton, creators and editors of the book. This year's topic, Why Don't People Get It, will be sure to garner some fiery responses. Of course, we won't be reading chapters in their entirety until August 21st (when the book will be released for sale on Lulu.com), but let's post one- or two-line snippets from our chapters... just for a little taste of the awesomeness to come. Sure, some people disagree with my views. Some commenters call me a moron. A loser. LAME. But so what? It’s hard to get a good game going without engaging your Queen. 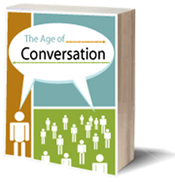 Contributors - comment here or e-mail me an excerpt from your chapter and I will post them all on my Age of Conversation dedicated page. Great idea! Here's my peek: Success on the Web-it is not a "tech" thing it's a "talk" thing! I am excited to be apart of this amazing conversation, and I am looking forward to the Aug. release! "We can help," said the excited account executive. "We have some of the best creative minds around. Don't worry, sir! You can count on us." Here's my snippet: "...We are all craving conversation. It’s a shame that the church down the street from you is not the first place you think of for a conversation like that." Shortly after they rolled the dice on me, a guy who only had one marketing class in college, I quickly realized that it’s easy for agency folk to claim that clients just don’t get it. It takes guts to show clients the light. Mine: "There is a tremendous amount of power – and money – to be had by controlling the microphone. But centralized communications will steadily lose their hold...We have the microphone now. And we’re not giving it back!" To carve a niche in this era of wildly dynamic change, pencils & pixels will have to adapt to be a whole new animal in the creative jungle. How do you become this huge, mighty, smart beast? Here is mine...nice to meet you! snd great idea, too. "For baby boomers in small town America, the test was our parents, not the paper. Into my 20’s, I thought my dad could find out “anything.” There were no secrets. I still miss that slap up the back of my head." Thanks guys! Wow, these are powerful. @Angela - Judging from your post, I think our chapters might speak to each other well. @John - Ooo, the steadfast client vs. agency battle. As an agency gal, this one is near and dear to my heart. Can't wait to read your take. @Steve - Your excerpt gave me goosebumps. No joke. It's so damn exciting that average people are gaining the confidence to speak out and claim their voice. @Arun - The new era of creative. Something we copywriters (ie, you and I) deal with every day, right? I really can't wait to read all of your chapters. And for the rest of you contributors - keep the excerpts coming! There are Non-Human Entities among us. Many people have seen them, or claim to have seen them. They move amongst us quietly, unseen by most. However, they carry immense power. These things can make or break companies, individuals, and careers. "Given as Machiavelli states, that mankind is incredulous to new ideas until they experience them themselves, how then do you move your company, business, yourself, into this new world? You let them experience it – but only on a much smaller scale. Moving your organization to a new level where conversations become action requires you to reduce the risk – and it is both simple and difficult. Simple because it is common sense – difficult because it requires faith in something new." Here is my peek from the section on Conversation to Action: "Companies that can quickly turn what they learn from customers into action have a strong advantage over their competition." We ‘digerati’ – the people who are creating incalculable masses of content that exists only online – are a treasure trove of material for the social historians of the future. But just as spam debased e-mail, and as flogs debase blogs, the sheer quantity of what we’re all doing may make the future historians’ job impossible. Oddly, intrusive advertising fatigue is causing a more complete integration of advertising within our lives. While the 30 second spot is generally disliked or ignored, we’re less concerned about being served advertising based on what is written in our personal emails. Ryan, you never cease to amaze! "Do you remember Theodore Levitt’s “Marketing Myopia” about defining something too narrowly? Move forward to today’s Age of Conversation, enabled by social media tools - like wikis, blogs, social networks, and RSS - that many define too narrowly." "An internet playground developed that toppled the walls of culture and geographical distance. Conversations exploded." "My wife has no idea that we’re in the Age of Conversation. She’s not embarrassed that she doesn’t participate. She doesn’t envy me that I do. She’s blissfully ignorant of web 2.0 and, in a way, I envy her." "True Digital Social Media is not a soft cost. It is a redirection. But is it compelling enough to the bottom-line to support massive redirection, to drive real change? Change challenges the enormous objects-in-motion that are corporations. Change is often a long term investment in the indeterminate future." Hi Ryan, thanks for posting a taste of what's to come. Within brains beyond yours, and even in your brain, lie hungry and thirsty parts to learn more. More about you, your business and all that it could be. That said it’s an opportune time to tap into multiple intelligences as a way to engage readers, workers and clients alike. Here's my snippet: "Inspiration: Action is what drives the economy, from international business to individual transactions at a garage sale. Communication from business to consumer is no longer a one-way street. Now consumers can talk back, and talk to each other about the business. It means a surrender of control." Check your facebook too, for an invite! As the BIG Kahuna (owner of Brand Identity Guru), I am shocked at how many business owners/marketing professionals just don't get it when it comes to understanding the value and importance of creating an effective, enduring brand identity. After all, brand identity is to business as oxygen is to life. Without it, you're in trouble. Increasingly, successful workers weave in mind-bending research about human brains to ignite their business models. By knowing the neuroscience … and implementing it … in understandable workplace lingo … employers are creating common sense models. Remember the wrinkles in the water: it starts somewhere, some place, then keeps on spreading. Until the wrinkles reach the shores and they fade away. Same principle, only the lake is now the ocean and the wrinkles don't fade but amplify. The Marketing Matrix is everywhere. It’s the belief that if advertising reaches enough people, enough times, then more than enough sales will happen. The Marketing Matrix is beyond repetition and recall, it’s an issue of control and conversation.